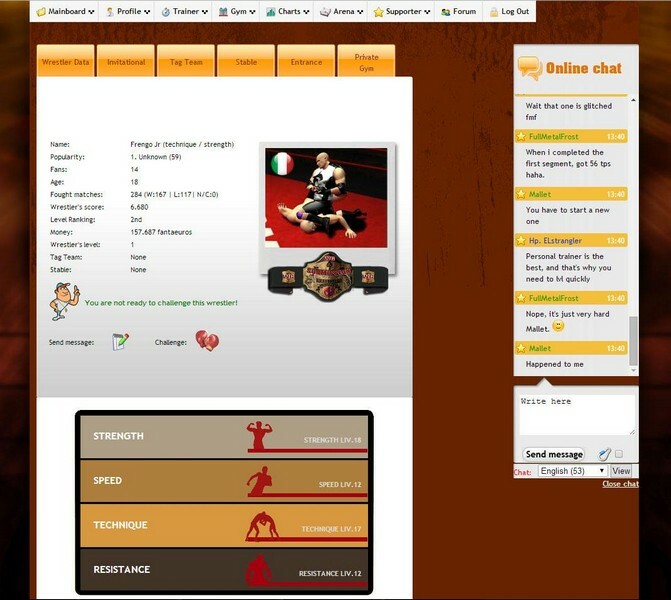 The Wrestling Game is a browser-based wrestling manager game with a variety of features. Select from five different classes of wrestler: Strength, Technical, Speedy, Resistance, or Balanced. Start out as a rookie, fresh from training, with rudimentary moves. Upgrade your abilities, compete in matches against other wrestlers, and use your winnings to further develop your stats, and work on your signature move. Create your own entrance, costume, and more! Create a Wrestler: Start out as a rookie in the wrestling industry, and fight your way up the ranks to become world champion. Learn a variety of moves, like grapples, submissions, and more! Training: The game features an extensive gym and training system in order for you to work on stats and skills. With nine different areas to work on, it's important to focus on your strengths, and cover up your weaknesses carefully. Automatic Matches: All calculations are handled for you, meaning you can simply choose an opponent, match type, and go. Review the match details, collect your earnings, and continue striving for the championship. Federations: Join a league, or create your own. Manage your roster, picking exciting match cards to create storylines, and ensure your wrestlers are paid a fair wage. Several championship belts can be won! Create-a-wrestler: Start out as a rookie in the wrestling industry, and fight your way up the ranks to champion. I still play it and i find it quite entertaining since my PC can not run high tech game. Long live text based browser games!